8:00 PM departure to train station. Take an overnight train to Lao Cai. Our tour guide picks you up at Lao Cai station. Travel to Sapa for breakfast. 8:30 Visit Lao Chai village located in a beautiful valley. This valley is full of terrace rice fields. Then, enjoy easy walking to Ta Van village and mix up yourself with stunning nature. Take photoes of the minority people working on paddy fields on the slopes of high mountains and Muong Hoa valley. Crazily beautiful and amazing Vietnam vacations are what you want to say. The first day of sapa tours end. Afternoon, free walking around beautiful town. The second day of Sapa tour ends. Free at leisure. Afternoon, visit Ta Phin village, the home to Red Dzao and black H's Mong people. Walk around this lovely village in peaceful valley. Drive back to Lao Cai. Take the night train back to Hanoi. The third day of your Sapa tours end. The train will be back to Hanoi at 5:00 AM. Transfer to your hotel. 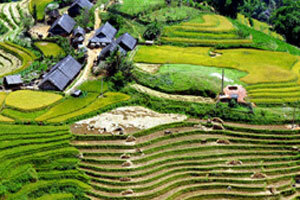 Now, your travel to Sapa package ends.